required by HIPAA, in one easy to use messaging network. professional peer to peer Medical Messaging system available? All this, and it fits nicely in your pocket. Featuring the highest level of security required by HIPAA, and fully JCAOH compliant. NoticeMed is paging, texting, and email, all-in-one, and incorporates on-call scheduling to provide answering service and call center functions. Membership is exclusive to health professionals, and is available not just for Physicians, but also for Physician Assistants, Advance Practice Nurses, Psychologists, Physical Therapists, Occupational Therapists, Chiropractors, Pharmacists, and Dentists. NoticeMed professional members enjoy secure, two-way, asynchronous messaging, mobile and real-time, including with staff and nursing stations. Members can send, receive, and reply to their messages, on their own time, as works best for their busy schedules, and know that their messages have been seen. 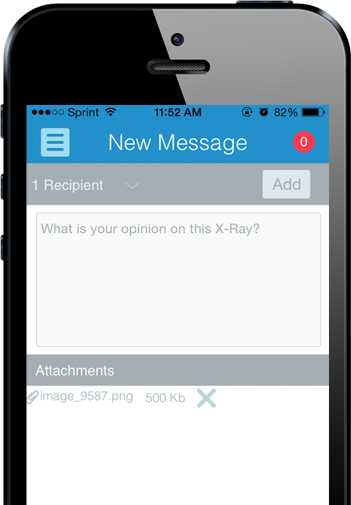 Messages can include document and photo attachments. Empowering personal and professional care. Approximately 35 minutes each day are wasted when conducting patient care, 19 minutes are wasted when completing documentation and 24 minutes are wasted when communicating and consulting with colleagues. Significant time is wasted during each workflow- primarily because of the inefficiency of pagers and the lack of adoption of secure text messaging- which has an estimated annual economic impact of about $1.75 milltion per U.S. hospital and more than $11 billion industry wide. and all health care organizations, large or small. No special agreement is necessary.